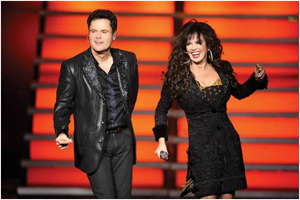 A triple dream has come true for singer Marie Osmond just as brother Donny Osmond and she get ready to leave Las Vegas next week for a five-day Bahamas cruise. Marie is celebrating the fantastic news that her work for Children’s Miracle Network has now officially surpassed $3 billion in contributions. She is celebrating a first-ever three-week run of holiday shows booked with Donny at the Pantages Theater in L.A. this December. And she is celebrating a planned 2013 concert run in London with Donny. First up is next week’s sold-out appreciation cruise with 2,500 fans from all over the world. It starts Tuesday in Fort Lauderdale, Fla., and returns from the Atlantis resort in the Bahamas on March 3. “Every day of the trip, we have something going on, be it exercise classes, speaking lectures, doll exhibits and, of course, we’ll perform every day,” Marie told me Tuesday. “It’s such an exciting undertaking because we bought the entire boat out for it. Marie and the Osmond family founded the organization in 1982, and funds raised go to a network of 170 hospitals. The siblings have several weeks of hiatus from their Flamingo headliner shows, which are continuing on the Strip with every indication that they’ll be there for a lot longer.